We are finding more and more ways to overextend ourselves in Appalachia . Our wants create debt—our debts force us to work dangerous unsustainable jobs. Nice homes, nice vehicles, nice this…nice that…. Happiness is no longer admiring the small things—happiness became what people on TV told us it should be, it became what salesmen and realtors told us we need to have. I’ve put a lot of thought into such things over the past couple of years. After losing everything in 2010, it was thoughts similar to these that helped me take leave of the mining industry. Life unto that point had been like that of many others I suppose; searching for happiness within a system built upon money. Granted, I had a rougher time than most in this particular struggle only to find that the end result of having more money was truly worthless if you could not enjoy it. Four years ago I’d never believed we could be happy living on less than a coal mining wage, but we are. These days I ponder if many of the people I worked with know what happiness truly is. I don’t mean to sound arrogant. What I mean to say is; could many of the folks I worked with be as happy living a simpler life without a high wage? I knew men who enjoyed their work. I knew men who, even though they remained tired and coped with chronic pain, found happiness in their life—but it was primarily through the material things they purchased. These days I worry about them and their families. I worry about how they will cope when the coal industry finally lays them off to preserve a CEO’s bonus . I know there are a few coal miners and their families who do realize this and most of what I’m about to say does not apply to them, but sadly those folks are becoming fewer and further between than ever before. Those of us who have taken care to study the history of the coal industry and have seen how those powerful companies regard the Appalachian coal miner, know that it is coming. We are screaming at the tops of our lungs to coal miners, trying in vain to tell them that they will suffer just as much as our forefathers did with every coal bust that came down upon them before. Today’s coal miners do not listen. In fact, they hate those of us who are trying to warn them. Instead they listen to the coal companies and coal politicians, taking in all of their propaganda, being led to believe there are jobs to be fought for until they walk to the mine gates that are closed in front of them, until they receive that notice that their retirement fund is gone. As assuredly as the men and women who blindly support coal believe there is a “war on coal” they will continue to cast blame away from the companies and politicians who tell them to do so. This is the nature of it, and it gives me no pride in saying such things about my fellow Appalachians, but the truth can be found in every ill word spoken by them towards people of a different opinion. It comes with every close-minded comment I ever heard underground about how “all muslim’s are terrorists and we should shoot ever damn one of em” or in the prejudiced jokes and comments I heard made about people of color and then witnessed those same men act friendly towards their African-American co-workers. Those coal miners and their families are not true Appalachian people anymore. 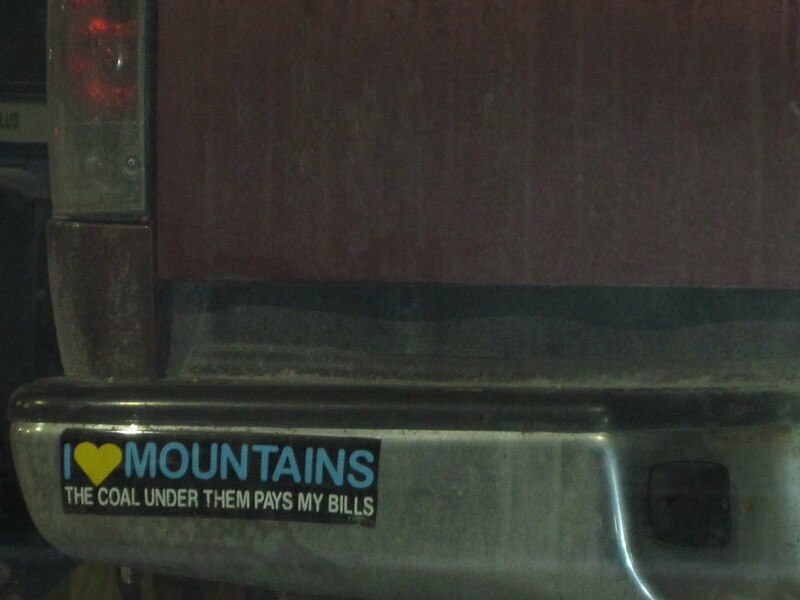 True—honest to God—Appalachians would think of their neighbors before a paycheck. They wouldn’t trust the real “outsiders,” companies who came in decades ago and swindled our forefathers out of their land and mineral rights, company officials who spend their days flying in corporate jets, who work in lavish offices, and who live in million dollar homes far away from the coalfields they mine. If I’m wrong, then perhaps Appalachia was never the great place I once believed it to be; the place I once had so much pride in because of the kindness of people. The “outsiders” who have come to help Appalachian people save their homes, to protect their water, and to bring in better jobs for future generations—who in many cases came without a DIME to their name—are more Appalachian than some of the people who have lived in the mountains for generations, people who now only want to make high wages and are happy to sell their soul to the company store. Sadly they are also selling their children’s souls as well. Every day I try to think of the images of my great grandfather, well up in years and with blacklung, helping the widow of my other great grandfather plant their garden. 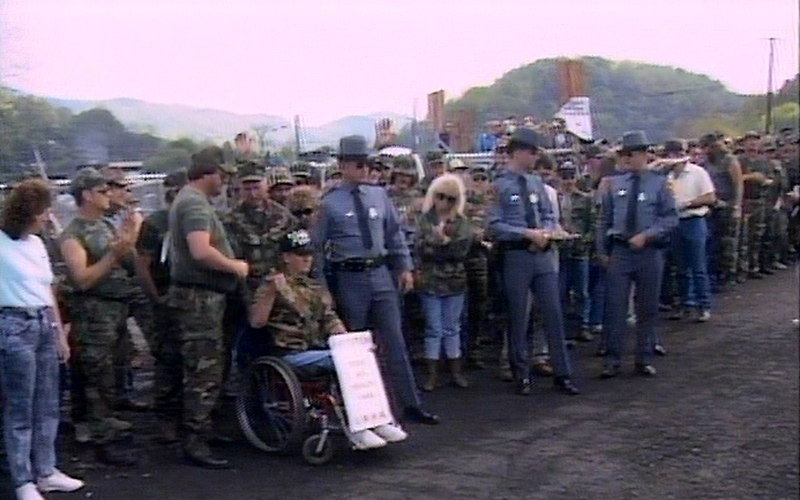 I try to remember being a boy and standing amongst the thousands of men and women wearing camouflage who had given up their paychecks to make sure the health benefits of disabled miners, retirees, and widows was given back to them by the coal company who had jerked it out from underneath them. That was my Appalachia. Today it has been replaced with $50,000 pickup trucks, Harley Davidson Motorcycles, Camaros, Friends of Coal stickers, and people fighting to make “Coal Mining Our Future.” It’s been replaced by young men and women who are so blinded by their high paychecks and selfishness that they are willing to turn a blind eye to their history and what’s happening to their neighbors. I'm a former strip miner. My father worked the same mines for over 30 years. My brother was a deep miner for 17 years and my list of relatives in the coal industry goes on and on. I, like you, came to the same conclusions long ago, years before I ever first heard the name “Obama”. I found out about you from the AP article. It's good to know I'm not the only one out here fighting a lonely battle to open people's minds and urging them to prepare for the future. Stick with it. You're doing a great thing. Thanks for the encouragement. It's good to know there are folks out there like you who saw through the propaganda early on. It warms my heart to know there are still some people back home who understand. It lets me know that Appalachia isn't completely gone so long as there are people who care for one another. It's happening Nick. This is what you have wanted ( Mike's post) to see happen. I am sure proud to know you. Your writing is wonderful as always. See you soon. Great great powerful piece of writing. Keep up the good work. Thanks Wendy. I'm proud to know you as well. You've done more than I have, but one day I hope to take this message on the road and stop hiding behind a computer screen. The real work is done out there, not here, but at least it is making a small difference. Can't wait to see you as well. Great article! I couldn't believe it at first! My wife and I were just discussing these very ideas. 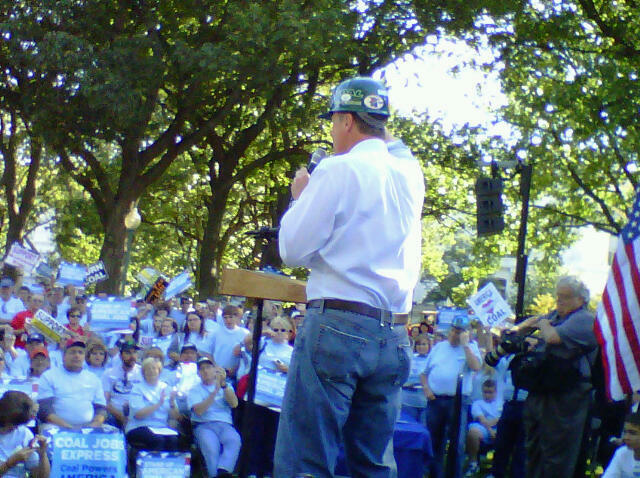 I am a fourth generation UMWA coal miner – I worked for 27 years underground. I look around me and see friends of coal signs everywhere, I see mountains that belonged to my ancestors totally blasted away. I hear them repeat everything the coal company says as if they were quoting from the bible. I wonder who are these people? They are not Appalachians and they have no connection with our culture or or history at all. They won't stand up for anything unless the coal company wants it. They will only fight for their own position and would sale out their neighbors to maintain it. They live in fear. Propaganda and racism is rampant and I wonder what are they thinking? They seem to be blinded by coal dirt. It's so good to hear the truth again. It's enough to make you sick isn't it? The coal companies have them thinking they are protecting their heritage by supporting coal mining, when their heritage was fighting the coal companies for every scrap of dignity they could get. Now all that dignity is gone, sold lock stock and barrel for pricey toys. They want to talk about Obama taking away their heritage, they need to look in the mirror and realize they sold it when they put a Friends of Coal tag on their vehicle. It's good to hear from people like you who know what Appalachia is really supposed to be. Thank you for all you've done for your fellow working man! If WY coal sells for $8-9 a ton and WV coal costs $24-25 a ton…which will be most likely mined and purchased? One can agrue many variables (i.e. 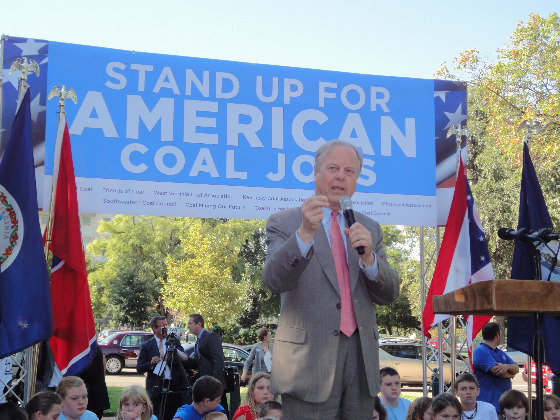 politics, coal company greed & disreguard for miners, “Clean Coal”, EPA, War on Coal, etc.) however, market price for cheaper, more abundant mid-west coal (and cheaper natural gas)likely trumps all other factors. At least some local folks like Sen. Rockefeller & KY politician saying “there is no war on coal” are starting to speak up about the realities of declining coal in Appalachia. I recently saw a comment/post that sticks in my mind; Why do we continue to lick the boots of those who kick us? Thank you for your thoughtful story. Hi. I'm a coal miners wife and I simply love your articles. So very inspiring to read words of reason. I'm so bummed how our area has responded to the recent election. They all seem to be brainwashed. You really put it all into words that I've been unable to come up with myself. So, thank you so very much! I'll continue to keep up with your writings. One last thing, my husband agrees with me and You on these issues. I am very proud of you….thank you! Thank You Nick! Your article tells the side that has been silenced too often. I am from a forth generation coal mining family. I know what it's like to have my coal miner husband laid off work. We went through very tough times. I know what it is like to see the coal company plan a bankruptcy to take away our UMWA hospital card too. I didn't not see an all out campaign to support us either. To be honest, this ended up being the beginning of our best times. My husband had to leave for awhile to work and I had to go back to work. I love the life we created without coal! I am grateful we never knew what it was like to see miners work and break safety laws to the point their fellow miners died. We never put friend of coal stickers on everything we owned: my husband worked everyday and gave a hard days work for good wages. That was enough. We never knew what it was like to blast away our mountains and pretend we had nothing to do with the flooding. We never knew what it was like to be told whom to vote for and threatened of job loss if we did not agree. We also never got to the point of telling our neighbors to love coal or pack up and leave WV. Let's care again! Thank you for a great explanation regarding coal prices. You are exactly right. The only motive behind layoffs and the “war on coal” is high profits and removing overhead to maintain them in a declining market. Those who choose to put the blame on anything else need to stop listening to rhetoric and research the truth. Thank you all for keeping an open mind and understanding the issues. So many don't and it really sets you all a part. Tell your husband to stay safe and we're keeping you all in our prayers. Hopefully we can get other industry in there to lessen the sting of all the layoffs. Amen Wilma! Caring again is exactly what we need. It's so good to hear like minded folks from back home. Things have gotten so bad since the coal companies broke the unions. Thank you all for speaking out, we need more and more of it! Coming from a long line of coal miners and ending up being an activist against Mountain top removal it is really good to see your post Mike. You and Nick both give me hope that people can see past the propaganda and get back to what I have always been proud of. It's felt like people have gotten past our history and the struggles we have had with the coal industry. Bless you both. Not sure if you have been following this story, but the comment above put it in my mind. Great writing, BTW! I sure have. It's ridiculous, but sadly not surprising. State mine enforcement agencies seem to be as “company minded” as the coal companies themselves. I'm going to write a blog about this sometime, but I was just in electrical retraining in Virginia and a DMME trainer started talking about a survey they did regarding what foreman felt the most emphasis was placed on. The answer was…you guessed it…production. What came out of that DMME officials mouth next set me on fire. He said, “Now if I was a foreman I'd tell my men, 'Your making big money so I want big results. '” It seems Virginia hasn't learned anything from Upper Big Branch. I really appreciate your perspective. I have no affiliation w/ coal mining myself, but I am fighting the same battle you are–trying to spread awareness of true Appalachian heritage. Since you have been a miner, you have double the right I do to be talking about it. You've got great content on here, and I want to encourage you to keep it up. I have lived in the mountains my entire life, and I have witnessed the destruction caused by coal-mining. I have witnessed the propaganda brainwash–I hate to say it–the majority of people in my community, and most of the surrounding communities. It seems an uphill battle, but one most certainly worth fighting for! Please check it out. I think you'll find it enjoyable, and hopefully as insightful as I've found your blog to be.